Has anybody out there seen the show “Life Below Zero” that airs on the National Geographic channel? The show follows four people/families that live in backcountry Alaska, and it displays how they live off the land and provide for themselves out of necessity. When my fiancé and I watch the show, he always asks, “Where is this in comparison to Greenland?” or “What city is at the same latitude in Greenland?” We look it up every week, and every time I forget the answer by the next episode! So, I have finally gotten wise, and I am writing it down once and for all. (See below). 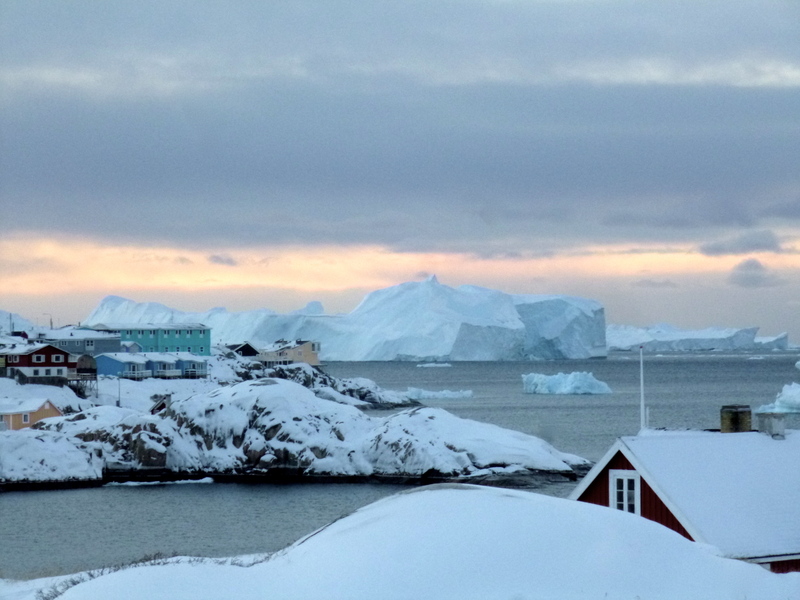 I ventured north to Ilulissat (69*N, or 297 km/185 mi above the Arctic Circle) in late November in search of the Greenlandic environment most people probably think exists year-round – namely, lots of snow, bone-chilling temperatures, and 24-hour darkness. It was not exactly as I expected, but regardless, what I found was a MOST enchanting winter wonderland! Do you think you know the smell of Ice and Snow? 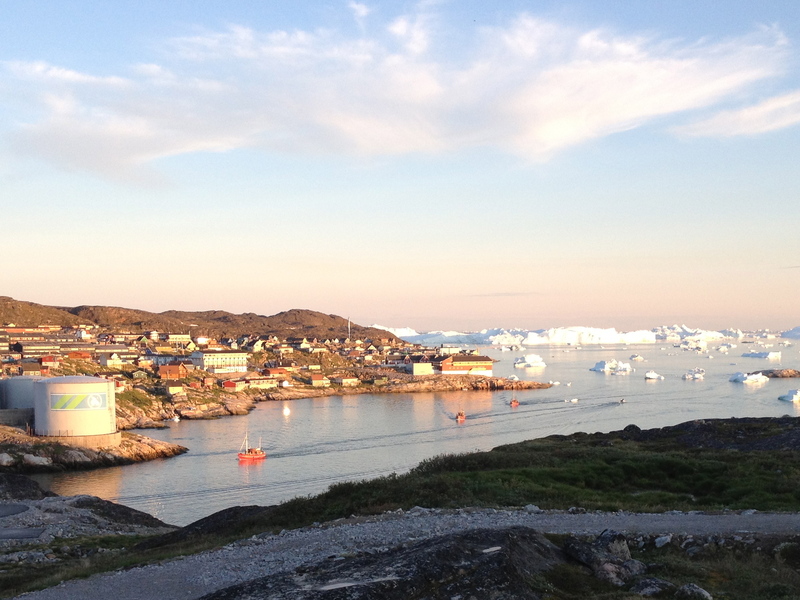 Well, you have not lived until you try it in Ilulissat in wintertime! 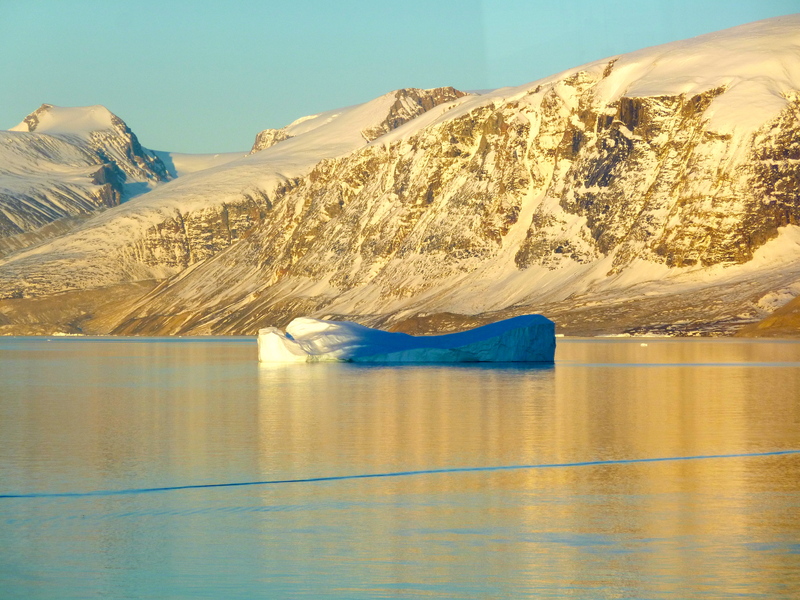 The combination of the mammoth icebergs in Ilulissat Ice Fjord and Disko Bay with the gossamer snowfall that floats effortlessly in the air is just intoxicating! It is also a feast for your other senses. The blanket of powdery snow on the ground is a bright complement to the colorful houses, and it makes an unmistakable crunch beneath your boots! Blow into a handful and watch how it glitters in the air like weightless diamonds. And your taste buds will thank you if you just go ahead and take a bite! 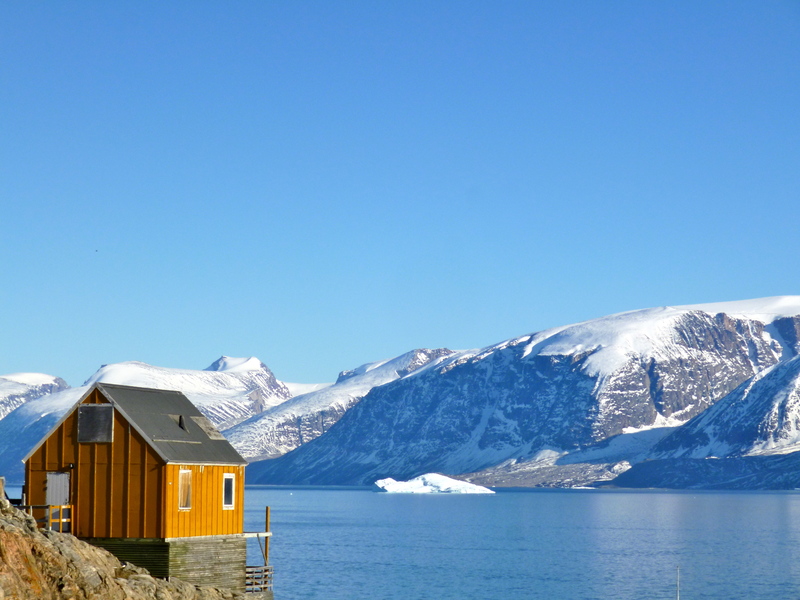 The temperature was between -8*C and 0*C (18-32*F) during the day, but with the deceivingly low humidity in Greenland, it never feels as cold as the mercury would have you fear! Let’s just say that my body has felt colder in Kangerlussuaq in March than in Ilulissat in November. 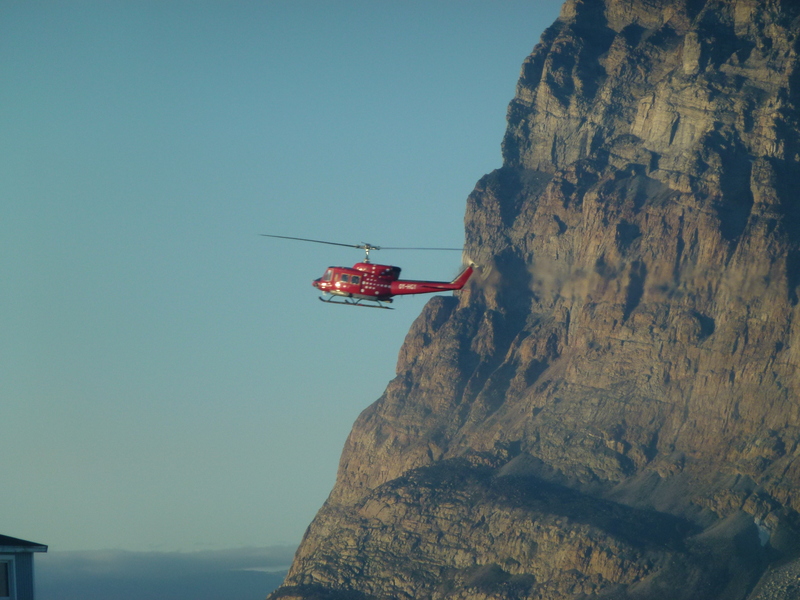 However, when the wind blows – you do feel that! The low-hanging sun was soft and quiet and romantic for a few hours a day – between approximately 11:30 AM and 2:00 PM. Its fleeting presence definitely gives a natural feeling that something is coming to an end, that it is time to slow a bit and hibernate a bit. In summertime, my body reacted very strongly to the long days. I always felt completely energized, and 3-4 hours of sleep was plenty for me to feel refreshed. So I fully expected the opposite reaction to the long nights – that I would struggle to stay away at 5:00 PM. But it was not the case! Experiencing the darkness was truly my main target for this trip. Having experienced the electrifying Midnight Sun for a few weeks in summertime, now I wished to see the other side of the astronomical coin. My rookie expectation was that if the sun did not cross the horizon, then the sky would be dark. So on 1 December, I expected 24-hour darkness that would not end until mid-January. 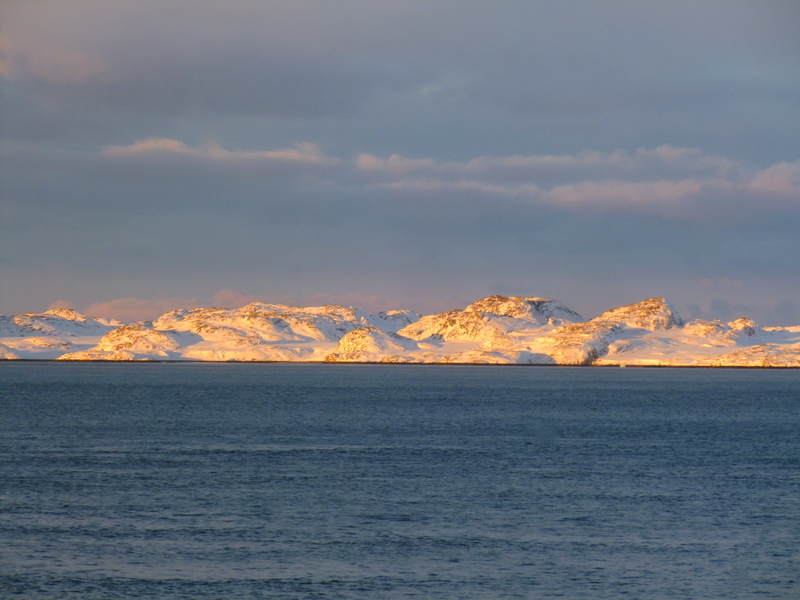 It turns out “polar darkness” is a bit of a misnomer, at least in Ilulissat. Even when the sun does not cross the horizon, its presence is still noticeable enough to consider it light out for a few hours a day. 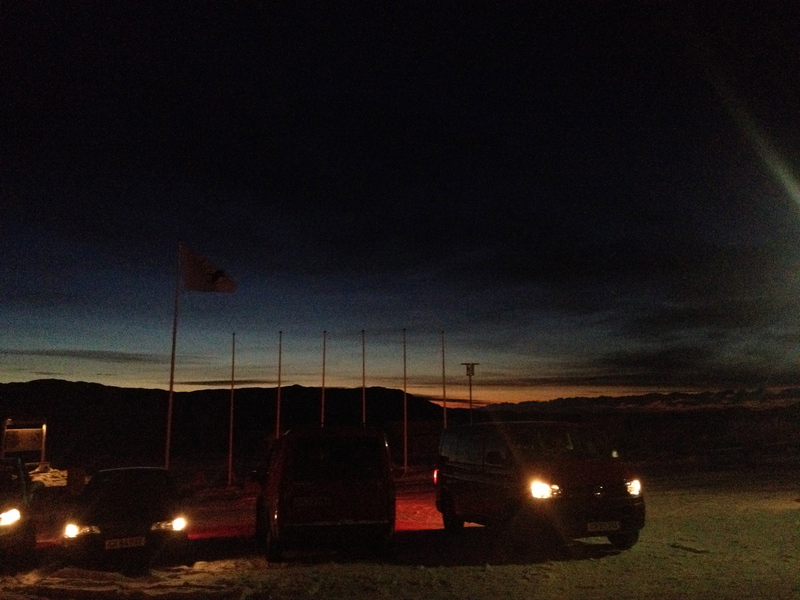 During my trip (25 November – 2 December 2013), it was dark between approximately 3:30 PM and 10:00 AM. 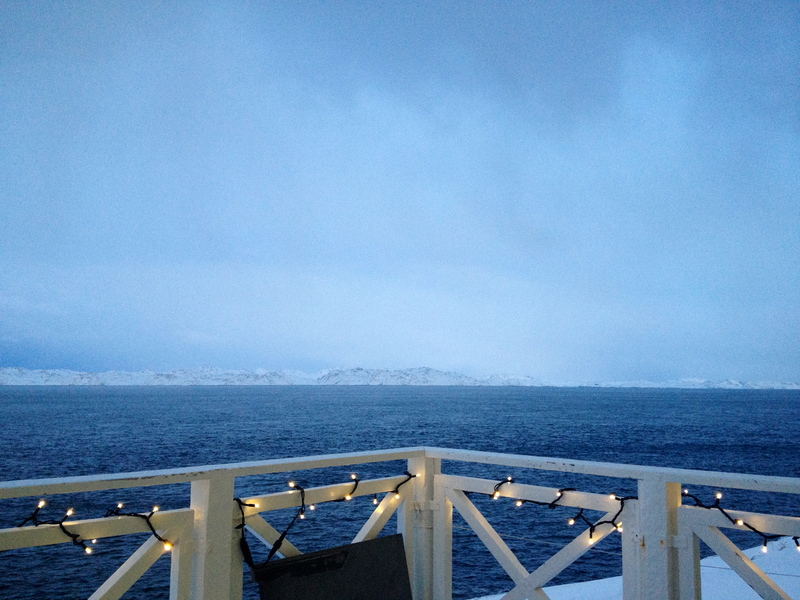 For example, the pictures above are taken after the last day with sunrise, at the lightest part of the day. The picture below is also taken after the last day with sunrise. Give it another 40 minutes, and the sky will be completely dark. 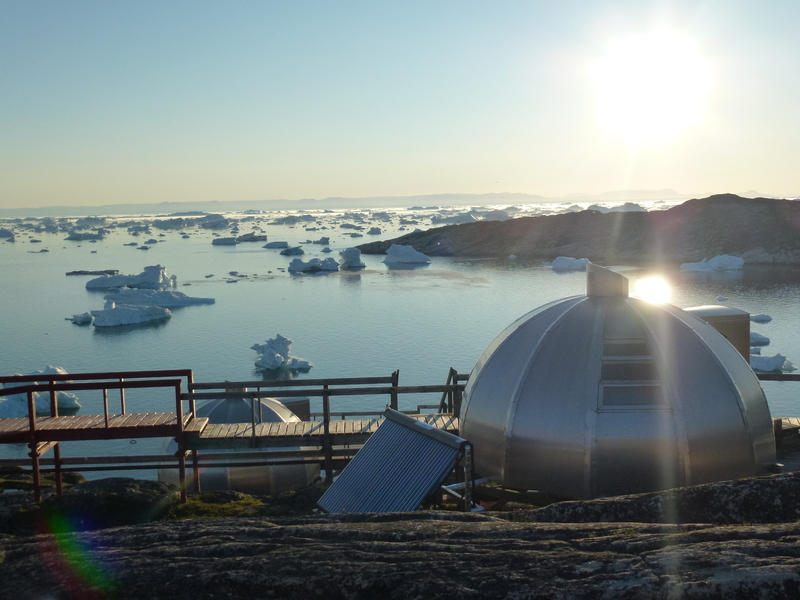 If you want to follow the ebb and flow of light above the Arctic Circle from the comfort of your own home, check out the IceCam, a 24-hour time-lapse camera located in Ilulissat. In order to experience true 24-hour darkness, one must travel another 438 km/272 mi north to Upernavik (72*N, or 695 km/432 mi above the Arctic Circle). I have never been this far north, so my interest is certainly piqued! 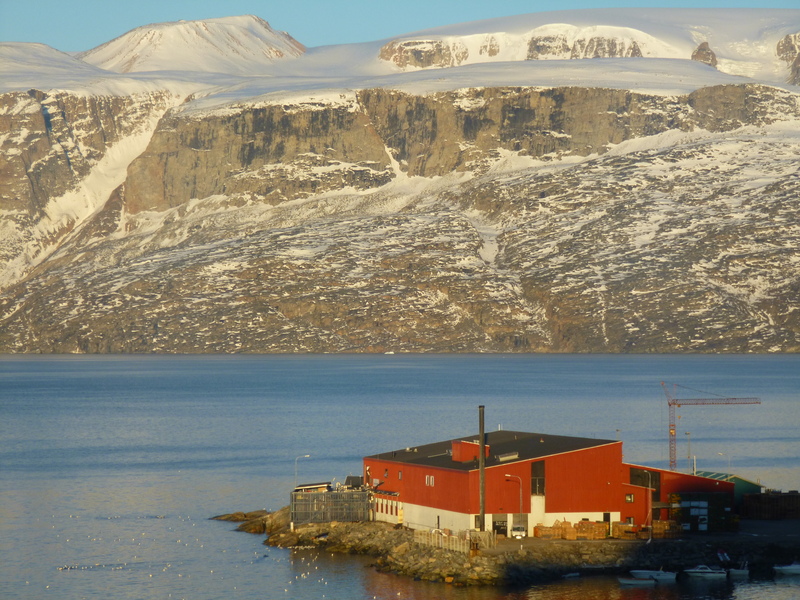 (The farthest north I have been is Uummannaq – 70*N, or 459 km/285 mi above the Arctic Circle). By contrast, go to the capital city, Nuuk (64*N, or 266 km/165 mi below the Arctic Circle) and the sun will rise above the horizon every day of the year, though there will still be many hours of darkness. 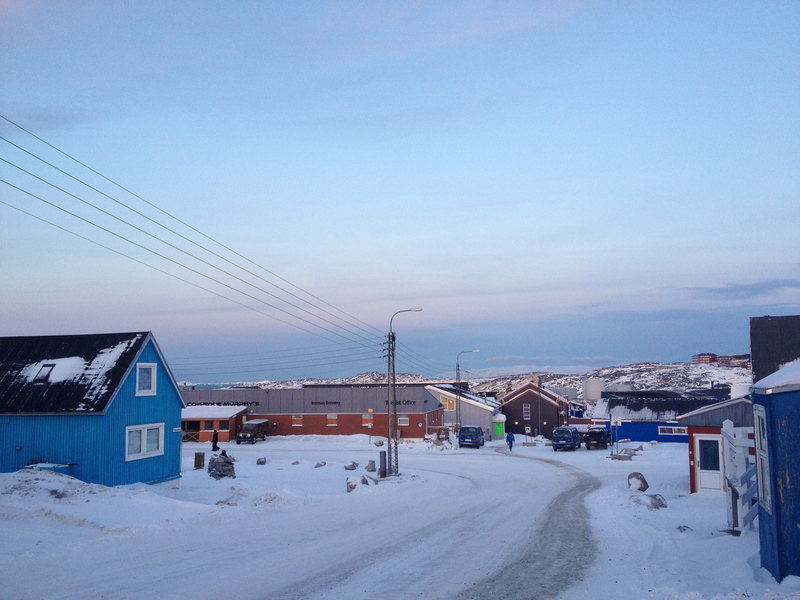 While I was in Nuuk (21-25 November 2013 & 2 December 2013) it was dark between approximately 5:00 PM and 9:00 AM. 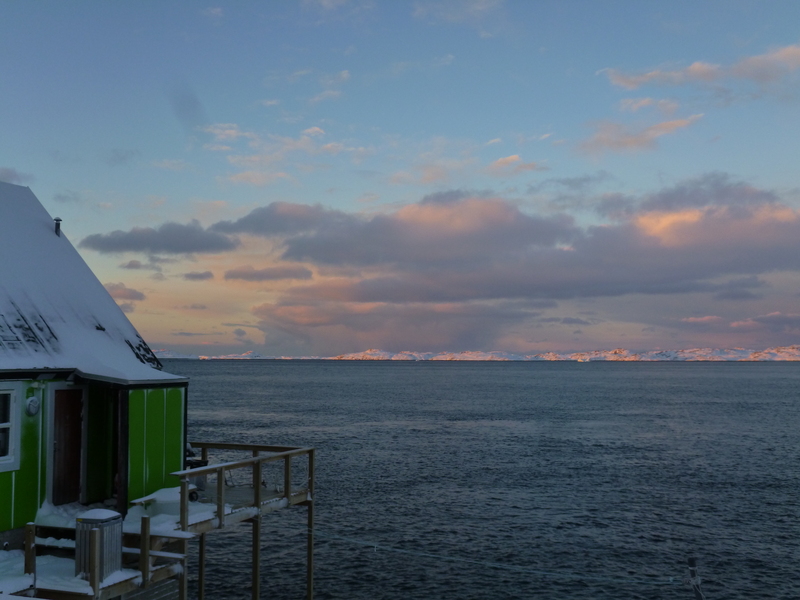 Here are some shots from Nuuk.